Many less experienced stagers feel they should use "stock images" to get work. They might even rationalize this little portfolio pick me up by saying "look at how many other stagers and interior designers do it." In my opinion, there's no valid excuse for using someone else's design photos to promote your design services. You are selling your staging or decorating talents, so the photos you use must show your own talent. Otherwise you are misleading prospective clients and this will come back to haunt you. Whether you're caught or not, you'll always know that you were hired based on the strength of someone else's decorating work. This does nothing to build your own confidence or pride in what you do. We all start somewhere. Usually in our own house or those of friends and family. As long as you are the one rearranging the rooms, it's your work and you can stand behind it. Check out the awesome job Lynn Trostheim of Sassy Grass Interiors did with her portfolio using her home and a family member's! We discuss this and related topics in the Staging Diva Training Program, course 2,"The Business of Home Staging: What You Need to Start and How to Grow"
I do not accept ANY stock images of staged rooms on my sites. If any photos on your Staging Diva Directory listing are found elsewhere, your page will be removed. What's in store for you in 2007? Did you miss the Staging Diva 2007 Home Staging Horoscope? For all of you who purchased a listing and haven't sent me your materials yet, get busy! The important spring real estate market is underway and now is the time to get your portfolio online so they can find you. Please send your materials in a series of emails once you have everything ready and organized. It's really difficult for me to keep track of who is missing what when I get everything in bits and pieces spread over many days and weeks. Are you really feeling stuck? Check out some of the most inspiring books I've ever read. The books that helped me get unstuck and take action. The books that helped me find my personal power and not run from it anymore. Maybe they'll help you too! I get a lot of emails from people completely befuddled by the various home staging training programs available. Your first question should be what specifically do you want to get out of the program and which ones address those specific needs? If you're not clear about what you want and you have not thought about your own strengths and weaknesses, how can you possibly make an appropriate choice? January flew by before I could get another issue of Staging Diva Dispatch to you! I've been flooded with emails and phone calls from homeowners and realtors looking for home stagers or just wanting more information on how staging works. I've referred 20 projects to Staging Diva Graduates in the last few weeks, plus posted stories of MANY home staging projects at The Business Of Home Staging which remain available. You'll find instructions there for how to be considered for any of them. It's also been a busy time building web pages for new listings in The Staging Diva Directory of Home Stagers. I'm still waiting for materials from many of you. Don't wait! This is THE season to promote your services. I'm building the pages in the order in which I receive all your photos and copy. Now entering it's second year, The Staging Diva Directory of Home Stagers will be actively promoted in 2007. I needed to wait until there were enough listings to launch an advertising campaign and we'll be there once the latest registrants submit their material. I've got as many of my own home staging projects as I can handle lined up for the next 6 weeks. 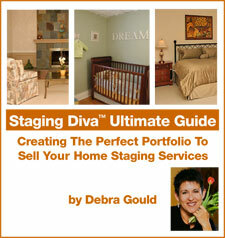 I'm always looking for Staging Diva Graduates who can take over Toronto area projects. I hope you find the content of this issue of Staging Diva Dispatch helpful; and I welcome any feedback or story ideas you'd like to see in 2007! There is a saying that "the best time to plant a tree is 20 years ago, and the next best time to plant it is today." What are you holding yourself back from doing because you think it is too late? Now is the time to plant the seeds for your future. Why not set 5 business building challenges to accomplish this week and next. You need to go for it. No one will reinvent your life or build your business for you. Book an appointment to make a presentation to a local real estate office during their weekly meeting. It is a chance to meet a number of agents all at once. Find out if your local real estate board allows home stagers to join as "affiliate members." Learn what benefits this would entitle you to and what the costs are. If you are reluctant to make such an investment, calculate how many projects you would have to get to pay for the annual fee. Is it reasonable to assume that you would get at least one project from your membership (YES), if you got 10, how good an investment would that membership fee be? Find out if there is a Mom's group in a neighborhood you want to work in that is looking for guest speakers. Work out a script for a 15-minute presentation on home staging. Remember questions and answers take lots of time and you don't need a script for that! If you find yourself saying, "I can't do that," ask yourself "what is the worst thing that can happen if I try these things?" If your worst fear is "looking silly," get over it! Teenagers worry about how they look to everyone else, but we should be past that. The odds of having all the business you want land in your lap with no effort on your part are about equal to winning the lottery! Stop letting fear hold you back. Just go for it! You will gain confidence with every new step you take towards your goals. It's only too late if you don't start now. This is an excerpt from one of the 21 weekly lessons in the Staging Diva Biz Booster eCourse. It's incredibly time-consuming playing matchmaker for hundreds of leads and then finding out who's in that market, contacting them, etc. In fact yesterday morning I spent over two hours doing nothing but answering phone calls from homeowners and realtors who need stagers and wanted to know more about staging and how to find a local stager. All of these calls were for projects outside my area, so I referred them on. If I don't immediately know who to send a lead to (and that they'll be ready to handle it), most home staging projects and speaking engagements are now being posted in "Home Staging Help Wanted" at The Business of Home Staging. You can read about new home staging projects anytime under the category Home Staging Help Wanted, and contact me directly by email if you're interested. You must follow the instructions provided for how to apply, otherwise you won't be considered for the opportunity. Please note that adding a comment on the blog is not the same as sending an email. Blog comments should only be used to comment on a story, they are visible to anyone searching the Internet. That's why an email response is more appropriate when you're applying for a project. Please note, if I've sent you a number of project leads and you haven't kept me informed of whether they turned into projects, you're unlikely to receive future referrals. How you present yourself is the single most important factor in determining your success. I want you to go out there and dazzle your community with your strengths and what you have to offer. With worksheets and plenty of "how to" information this guide will show you how to get out there and win business. Building trust and credibility are key to selling your home staging services as discussed in The Staging Diva Home Staging Training Program. A key component to establishing your credibility is how polished your portfolio is. It's not just what you say, it's how you say it. It's not just what you show, it's how you show it! This new Staging Diva Portfolio Guide will take you through the steps to building a winning portfolio, from what should go in it, to how to improve how it looks and sounds. Order now at the pre-release price and s.av.e. $25! A graduate who completed the program almost 6 months ago writes, "I am kicking myself for procrastinating on getting my material together for the Staging Diva Directory. There was a home staging article in our local paper that I wasn't quoted in. While one of the stagers they quoted is well known, the two others are new and they only got press because they had websites so the reporter could find them. Lesson learned! Look for material from me in a week for sure!" That was six weeks ago, and still nothing! Believe me, I'm an expert procrastinator myself. But I try to procrastinate on less important matters like nice-to-do, but non-essential household chores (and filing which I hate). Take a look at your "To Do" list and decide which items can move to your "Stop Doing" list. If you put off the things that will build your business you are seriously hindering your own success. Now is the time to get your portfolios together! Get yourself on the Internet so homeowners, real estate agents and the media can find you as we head into the busiest real estate season of the year. Either build your own site, or give serious thought to joining The Staging Diva Directory of Home Stagers. It is your easiest way to get this taken care of. You write your copy and send me your photos and I do the rest, generally within a few days! There is a one-time charge of $395 to build your page, set up all the links and write the code so search engines can find you. Hosting your profile page in The Staging Diva Directory of Home Stagers costs only $45/month (beginning 7 days after you register), less than the cost of a Yellow Pages ad. You will have a professional looking Profile on a high traffic home staging website, doing the selling for you 24 hours a day, 365 days a year! And you only need one good project to have it pay for itself. If you don't believe that the Internet is the best source of home staging jobs, check out the over 50 Stager Help Wanted projects I have posted at The Business Of Home Staging. I only started posting these at the end of August. Many are visitors to sixelements.com and others have discovered stagingdiva.com. These home staging projects are only a fraction of the many I am contacted about. If you're still trying to write your profile for the Staging Diva Directory of Home Stagers, you might want to check out the listing for Laura Jensen of Lakeshore Staging(WI). Laura did a great job of weaving her "success stories" into her copy and really paid attention to the use of headlines and sub-heads. It's important to remember that Internet visitors scan before reading. If something catches their eye in a headline or sub-head, they're more likely to read the rest. Congratulations to Joanne Babynec on moving Signature Home Staging to her new home in Edmonton. One of the benefits of staging, is that once you've figured out how to get started, you can relocate anywhere. Change your contact information on your website (or Staging Diva Directory Listing), reprint your business cards with a new phone number, and you're ready to keep growing! Congratulations to Staging Diva Graduate Gina Dougherty of Fusion Design Consulting (CA) who has a TV production company coming to tape her in action and interview her on camera as a candidate for a new Real Estate/Staging show they're working on! Debbie McGennis Howe (FL) of Set the Stage Interiors who contacted The News Press as we talked about in course 4 and got them to cover her in the business section of the paper. After one week she got her first two projects (one of them for a $1.8 million home) with a lead on a third project. By the way, it's almost impossible to get those results by running a newspaper ad. Public relations is WAY more powerful. Congratulations to Allegra Shann, Styled and Sold, LLC (MD) who made a successful home staging presentation to over 65 local realtors. Bravo Leah Fritz, Perfect Place Home Staging, LLC (WI) who was chosen over another local stager to speak on home staging as part of a realtor training program. Initially another stager had been chosen, but when the teacher found Leah's profile on The Staging Diva Directory of Home Stagers, she chose Leah instead! I'm really proud of Kris O'Neill of A Cents of Design Inc. (GA) who not only got written up in her local paper, but is decorating a room for the HGTV show "My First Place." She completed the Staging Diva Program only 6 months ago. How her life has changed! Way to go Kris! For the third time in 2006, the Staging Diva Home Staging Business Training Program was THE ONLY home staging business opportunity featured in Entrepreneur Magazine's Start Up Guide. This edition was on newsstands until Jan. 29/07 and I almost missed it until I went magazine shopping and just stumbled upon it! HomeStyle Magazine is featuring my bathroom redesign and staging tips and the stagingdiva.com site in an article in January 2007. The magazine is distributed in newspapers to about 12 million households in the United States and will definitely build traffic to The Staging Diva Directory of Home Stagers! I'm part of a feature article on Home Staging going out in the Spring issue of USAA Magazine to their 5.6 million members. USAA is the only fully-integrated financial services company in America and serves the military community and their families.